A painter, who we cannot identify, poses seated before the camera lens of a photographer, whose identity we do not know either. The artist has a proud air about him, satisfied with the work he has just done and whose results he is showing in public. The roomy bright surroundings in which he is sitting look familiar to us. It is most likely the studio or workshop in which he works, a place with a dual purpose: to be at once functional and representative. Since the Renaissance, the artist’s house has become an indicator of the social prestige, the recognition and the reputation enjoyed by professionals who were often held in contempt because their activity was considered manual work. However, our subject does not seem to correspond to the stated profile. To begin with, far from being a cramped space, the roominess we sense suggests that we are looking at someone who enjoys a well-to-do social position. The room is occupied by a large number of objects (furniture, mirrors, tapestries, carpets). They configure a cluttered interior, with a tendency to recreate the effect of the horror vacui, and project the image of a certain degree of spending power and an interest in collecting eclectic objects. 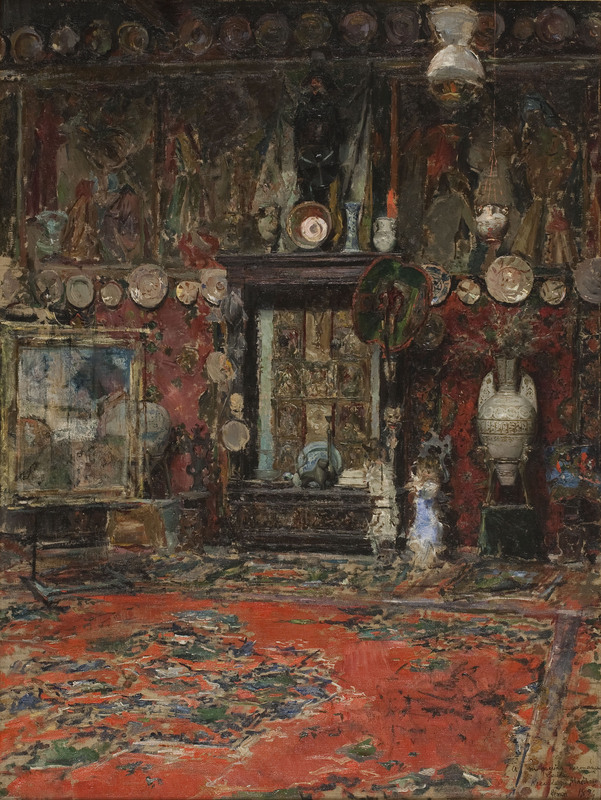 In some ways, it follows the model of other studios of the time, such as Fortuny’s, which we can see in the museum’s rooms. In the background we see a medium-sized work, depicting a rather unconventional scene. Before our eyes, and enveloped in the orientalist aesthetic of a light opera, a man appears, dressed in oriental clothes. In his hands he holds a tray on which there is a man’s severed head, whose identity, as if it were an infinite game of mirrors, is once again unknown. As I do every morning, I sit down in my work chair and I switch on my computer for reading the emails I have received. Today, the fates of computing have been kind and by an email they reveal to me the existence of a series of images, among which I joyfully discover a photograph that looks familiar to me. Indeed, almost a century and a half later, in an exercise of random intrusion I enter the Parisian workshop of the Italian painter Giuseppe Signorini (1857-1932) to whose name I have the pleasure of putting a face, who is posing in front of a work that he has just painted and which I know very well: Justice in Morocco, now in the Museu Nacional’s collection. We know that Signorini had a studio in Rome and another one in Paris and that, moreover, he was a great admirer of Mariano Fortuny. I now also know, from the date of the work, that this photo of the painter in his workshop was taken in about 1889. Everything gradually starts to fall into place. I want to know more and my curiosity leads me to look for clues. I look closely at the photograph and discover a detail that I had previously missed. Now I know what it is: the frame of the watercolour is not the same in the photo that in the museum’s work. 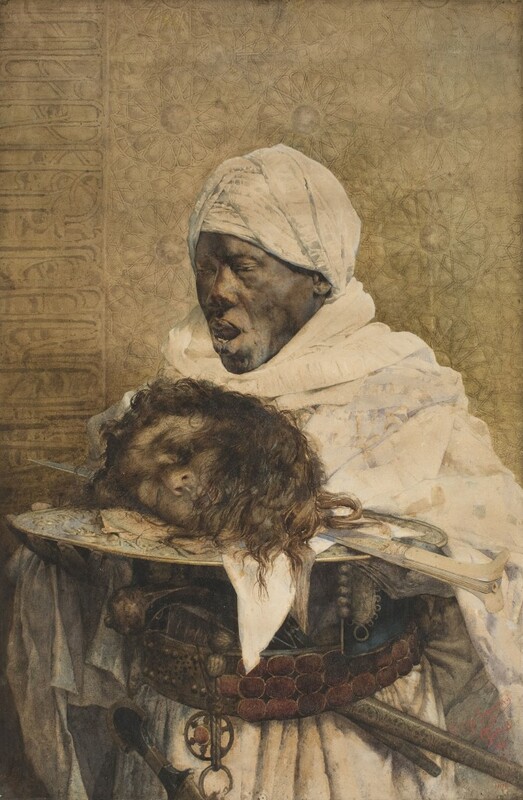 In the painter’s studio the work has a different frame to the present one, which is the one hanging in the room in the museum dedicated to orientalism. How did this watercolour end up being admitted to the Museu Nacional d’Art de Catalunya? 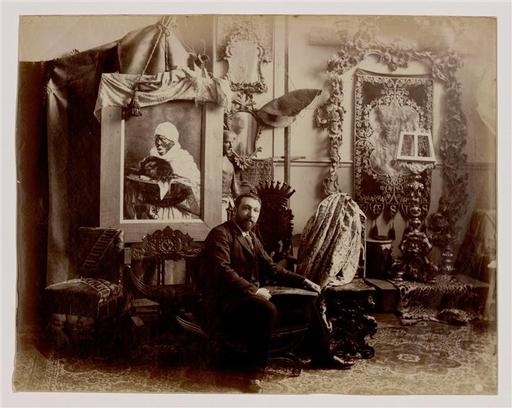 when it arrived in the museum, what frame was it in, the one in the photo from around 1889 or the present one? We shall talk about it in a next article.